Celebrating the achievements of the Sherborne Foundation over the past 20 years, we have recently produced brass plaques which will appear on all projects made possible by their fundraising work. This coincides with the launch of the Sherborne 360° campaign to support the continued delivery of all-round educational excellence. We came up with the name, the campaign identity and are now looking forward to the campaign roll-out. We have recently launched the new campaign to support the aspirations and ambitions of young people in the UK and help to change lives by widening opportunity at Wellington – to ensure that the make-up of their student body reflects today’s dynamic and diverse society. Recently launched brand identity for Frost, our friends and neighbours here in the Light Bulb. Frost is a design studio practising in architecture & interiors with a reputation for bringing creative solutions to difficult sites together with the technical knowledge to deliver building projects. Re-brand for Williams Harlow, a leading independent firm of estate agents with offices in Banstead and Cheam villages, Surrey. The fully responsive website is specially built to pull in the Vebra Alto estate agency software for searches and property details. Brand refresh for Club Workspace, the fast-growing network of creative co-working spaces throughout London, delivered by Workspace Group. Brochure for The King’s Fellowship, a group providing advice and guidance as the school continues to develop and grow; by getting more closely involved in different aspects of the school’s work, and as advocates of the school at the highest levels. The body will eventually consist of 85 members – the original number of pupils when the school first opened its doors in the Strand in 1829. Fellows are typically appointed for ten years and candidates are recommended by the Head Master and existing Fellowship, and approved by the governing body. Bottle labels for a range of craft beers brewed by The Kiln Brewery, an independent start-up nano-brewery in West Sussex. Board Walk Transatlantic Pale Ale is a full-bodied, smooth ale blending the best English malts with full flavoured citrusy American hops. Brewlin Rouge is a Red Beer with complex malt flavours combined with multiple hop additions to create a full flavoured easy drinking session beer. The Skinners’ Company is one of the ‘Great Twelve’ livery companies of the City of London. It developed from the medieval trade guild of furriers and was incorporated by Royal Charter in 1327. Today it is a major not-for-profit organisation involved in running schools, sheltered housing and grant programmes for individuals, educational institutions, and a wide range of small organisations throughout the UK. We have recently refined and re-drawn their coat of arms in which all elements are sacrosanct – granted by permission of Royal College of Arms in 1500. Tonbridge School has a clear long-term strategy which sets out their vision and aims for the future to make sure that Tonbridge continues to be a world-class school. The Excellence for All campaign focuses on three key areas: transforming the campus, widening access and broadening the curriculum. 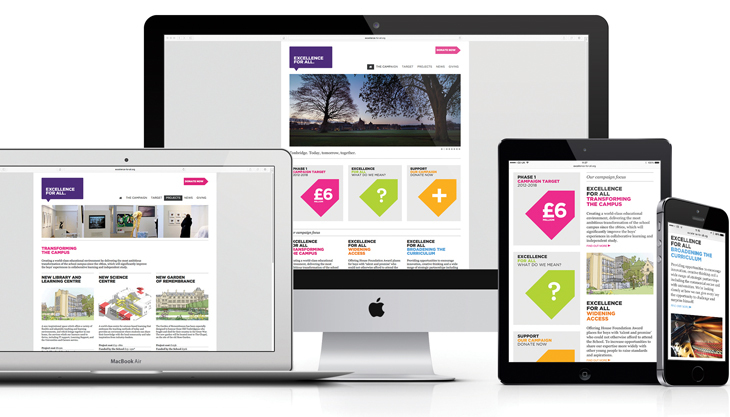 The recently launched, fully responsive website gives an overview of the campaign and the facility for online donations. We have recently named, created the brand identity and launched the new fully responsive website for Monty Pieman, a maker and purveyor of gourmet and award-winning pies. New branding programme for Aktrion, an international business and manufacturing support services provider, offering expertise in the Automotive, Food, Logistics, Print and Transport sectors, helping their clients to improve performance and service levels, reduce costs, and maximise flexibility. We not only created a cohesive and consistent brand identity, but also helped them to understand and communicate their business structure in a much more succinct way. Their brand profile has been elevated and their customers are now clearer on the expertise they offer. Fully responsive Wordpress site for the Reigate Grammar School Foundation’s bursary campaign, providing information, fundraising totaliser, news updates, real life-changing case studies and donation facilities. The bursary fund aims to transform the lives of talented local children whose potential is far greater than their financial means. Fabric is a start-up people development business that works to get into the fabric of an organisation in order to gain an understanding of current and future needs. Armed with this information, they develop culture, values, best practice and training strategies. The visual language around the brand identity will utilise the ‘equals’ graphic for all key messaging. The new website for Edward Dudfield, a high quality printer based in Ilford, has recently gone live. Built in Wordpress, it is a simple, vertically scrolling site with large background images, providing a stunningly visual environment in which to showcase their work and services. A simple typographic solution, for this high quality printer’s new brand identity, that allows the print finishing techniques and high end stocks to take the limelight. 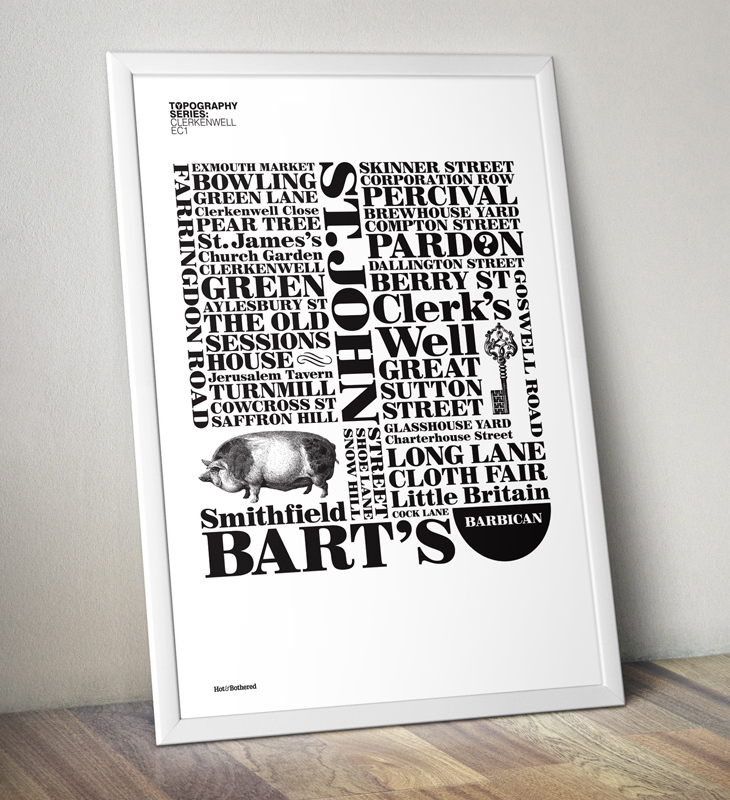 Our new Clerkenwell EC1 typographic map poster is now available from our shop. Its an A2 hand-pulled screen print on Strathmore Writing, Platinum White 236gsm. Numbered and stamped limited edition of 100. The new website for Sutton & Epsom Rugby Club is a completely user-friendly and visually engaging design solution for what is a very content-heavy site. The main challenge was building the back-end CMS to include intelligent dynamic fixture widgets that make it easy to update fixture lists, match results and match reports for 25 teams, through minis, juniors and seniors to the 1st team, as well as quick and easy posting of current news items and club events. A comprehensive magazine-style guide to everything Workspace. This 116 page big issue features day-in-the-life interviews with customers, Mr & Mrs Smith and Bulldog, new developments in the pipeline and information on all products and services and complete property listings. A new identity to encapsulate the nature of the society: the promotion of friendship and the sharing of cultures between Britain and Spain. A fresh, colourful and approachable logotype, integrating the two cultures through their flags whilst subtly representing the B of British and the S of Spain. We are currently working on the new website which will be launching soon. Brand identity for a new campaign launched by The Foundation at Reigate Grammar School. The 1675 Bursary Fund aims to enrich young people’s lives by offering the life changing opportunities that come through an RGS education. The identity will work in a wide range of different colourways and background holding devices to best reflect each campaign application. Brand identity for a new homeware and gift shop, with adjoining traditional tearooms, in Chipping Campden in the Cotswolds. The design solution features a weaver bird, well-known for being house proud. The new Club Workspace at Kennington Park commissioned some of our film poster ideas to fit into their interior space. The Italian Job was transformed into a large vinyl wall graphic and others were produced as A1 canvas prints. KX Private Members Club asked us to design their Christmas party invitation to send to their members. The result was an A5 Colorplan duplexed board in black and white, with a clear foil KX snowflake and a silver foil X to highlight their tenth anniversary. The entire project from design concept to mail out was completed within 4 days - and even included a separate insert detailing club opening times over the holiday period - a tight schedule all wrapped up for Christmas! We have recently designed the book cover and jacket for a novel by Antony Bird, a story about the battle of Le Cateau, a battle which saved the Retreat from Mons and was instrumental in determining the course of the Great War. It is told through the eyes of six soldiers and officers, one of whom, Lt. Bernard Montgomery, would go on to become a field marshal. It was fought in the beet fields, in the towns and among the corn-stooks. It was the last British pitched battle of open warfare in the Great War, when the Somme and Ypres were just places on the map. Its a great read and now available to buy on Amazon. 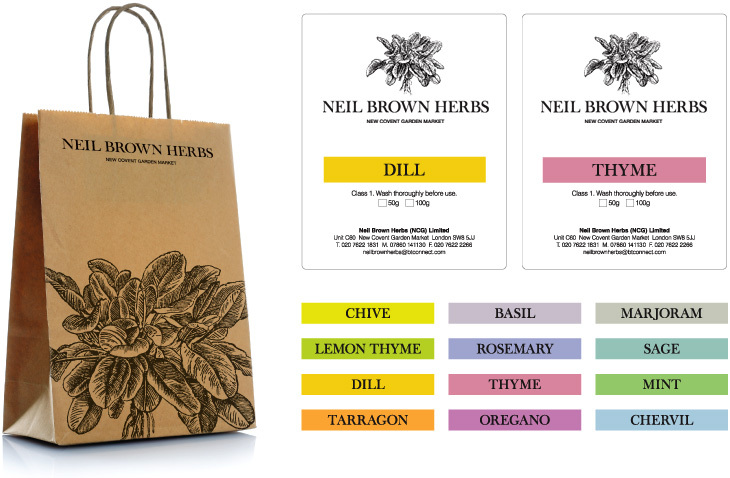 We’ve recently designed a new brand identity for Neil Brown, a wholesaler of fresh herbs and spices to retailers and restaurants. The traditional woodcut illustration communicates experience and the high quality nature of their produce. The first items to roll out are packaging labels, all colour-coded to create visual stand-out on the shelf. We have recently delivered the first annual sales brochure as part of the rebrand for Workspace. It’s a comprehensive 108pp guide to the company and what it has to offer SMEs. It features customer case studies, business advice, full details of all their products and services, plus an extensive listing of their property portfolio. This month saw the initial rollout of our brand evolution for Workspace Group, who provide business space to over 4,000 customers in 100+ centres across London. We’ve been involved in the entire process from initial research, focus groups and brand workshops through to the implementation of the brand and its guardianship. The circles design solution is an evolution of the previous identity and represents growth, innovation, inspiration, collaboration and community. The identity appears in 9 colourways to reflect the wide array of different character properties within their extensive portfolio. We have recently designed and produced this year’s Annual Report & Accounts for IBAS (Independent Betting Adjudication Service) with a strong focus on typographic pull-out statements and financial results. IBAS acts as an impartial adjudicator on disputes that arise between betting/gambling operators and their customers after they have been through the operator's own internal dispute procedures and if a deadlock exists. We’ve been producing a series of marketing pieces for UKFT (UK Fashion & Textile Association) to highlight British designers at international trade shows. The project requires a recognisable style that can be translated across the many disciplines of the fashion and textile industry – our designs, based on the Union Jack in different colourways, works perfectly. Materials include show listings, leaflets, banner ads and exhibition stands. The flexible design allows for each show to own its own colourway and makes for a vibrant and highly-visible brand. Shows to date include Paris, Berlin and New York. Here’s our take on an information-design piece for the Olympics. The central London venues are in red and the outer London ones in blue. Visit our shop to see our other posters for typography, film and sports. We have recently taken delivery of our new packs of limited edition poker-size playing cards. Expertly produced by Piatnik in Austria, each suit has its own particular typeface and each card features a unique typographic design solution. Available now to purchase from our shop. We have just designed and built Jigsaw Colour’s new website which showcases their most recent and best litho print projects. The concept of the site is bold simplicity. Key statements position them as the printer of choice for the design industry and detailed photography highlights the finer details of their work. Photography was art directed, shot and retouched in-house, which gave us total creative control of the entire site. Alongside the site we have also designed and built an e-campaign to inform clients of the new site launch and ongoing monthly news. Feel free to visit the site at www.jigsawcolour.co.uk. Our latest packaging design for Piatnik has just been delivered. This pack of themed playing cards celebrates poster designs for London Transport that date back to the 1920s. Each card features a different poster, with subjects ranging from sporting events to tourist attractions. The collection is a tribute to Frank Pick, the main inspiration behind London Underground's corporate identity and brand. Pick established the style and look of the posters by commissioning artists as diverse as McKnight Kauffer, Paul Nash, Graham Sutherland and Man Ray. Their brief was to produce eye-catching designs which would capture the imagination, and make people travel. They did just that. Sometimes a single colour job can have more impact! Our flyers for Volcano Coffee Works were commissioned by Workspace to promote the refurbishment of their Parkhall Business Centre which includes a new café. The café has been set up by the owner of Volcano Coffee Works, who already runs his business from Parkhall – the café is due to open on 10 April. To reflect the hand-roasted nature of the coffee we printed the flyer on a heavy, tactile, recycled board. In summer 2011 Workspace launched their first two Club Workspace venues; drop-in creative hubs aimed at customers who benefit from networking and collaborative environments. Our brief included the overall naming, identity and visual style for the brand. We then designed everything from external and internal signage, marketing literature and website, right down to the finer details of coffee cups and meeting room signs. Membership has exceeded expectations and plans are in place to launch two further Club Workspace venues in the coming months. KX has recently launched its Quintessence program, designed for individuals who wish to set themselves specific health & fitness goals. A team of experts tailor a four or eight week program to include personal training, holistic therapies and a daily menu that can be delivered to each paticipant. Each menu is constructed from scratch by the KX nutritionist and head chef. We have been responsible for branding delivery vehicles and for the design and production of a range of food & drinks packaging. The packs have to hold both hot and cold contents and withstand transportation. They are also used for takeaways from the KX restaurant. UK Fashion & Textiles (UKFT) sits at the core of its market, working ceaselessly for the benefit of fashion, clothing and knitting businesses across Britain. UKFE works closely with buyers and agents from around the world to ensure that working with British brands is easy and profitable. UKFT asked us to design and produce their Fashion Buyers' Guide - a key aspect in helping members build their businesses in export markets. This 84 page, perfect bound guide lists every member and the merchandise and services they provide, and is mailed to buyers worldwide and is available at many international trade shows. Annual Report & Accounts for EAB – the theme this year is all about ‘working together‘ - bridging the financial gap between Europe and Mena. Workspace Group aims to make the communities in which it invests better places to live and do business, and E3 is the new name for their community investment strategy - the key to which is enabling engagement between education, employment and entrepreneurship. We came up with the name and created the new brand identity - we think it speaks for itself - a clean, simple, highly effective and clever design solution. The brochure, featuring nine new carpet ranges, was art directed by us and shot in six different locations by Dominic Blackmore, with styling by Sarita Sharma. The stunning photography is combined with beautiful design detail and includes some amazing designer furniture and props, courtesy of Andrew Martin International. Naming and brand identity for an events company who'll tell you everything you need to know about wine and have a lot of fun at the same time. Hawes & Curtis, the renowned shirtmaker, has launched a new flagship store in Jermyn Street, St. James's, which includes the all new Café Curtis, an upmarket café/restaurant providing a welcome respite for shoppers. H&B has designed the identity and all launch materials for the new café, plus a whole range of branded merchandise, including salt & pepper sachets, sugars, coffee cups and clutches, carrier bags, napkins, pricing labels and menus. The Safer Communities Partnership works very closely with community groups in Haringey to ensure that they are actively involved in crime reduction, and as such are launching a campaign to highlight motor vehicle crime throughout the borough. Haringey Council appointed us to design all the campaign materials, utilising the winning entry from a drawing competition they recently held. The campaign will be rolled out on to bus, tube and web advertising, as well leaflets and stickers in the forthcoming weeks. H&B have just launched a new website for the Diploma in Retail Business. The Diploma is a new qualification that combines theoretical study with practical experience and is part of the national 14-19 Reform Programme being rolled out over the next five years. The Diploma in Retail Business will place retail and its supply chain on the educational map and every young person in England will be entitled to study the Diploma in Retail Business from 2013. It will provide the skills, understanding and motivation that employers need in new recruits. Brand identity and supporting marketing literature for a serviced office complex in Vauxhall, South London. Christmas card highlighting the new identity we have recently designed for Alexander Ash, taking the initial of each of the directors. Aa are a leading specialist provider of recruitment services in the Information Technology and Communications (ITC) Sectors. Lords are the leading local Residential Estate Agency in South West London and Surrey, priding themselves on offering the highest levels of customer service to home sellers, buyers, landlords and tenants alike. Lords appointed us to 'freshen up' their brand, and produce a new website, company brochure, direct mailshots, property boards and newspaper advertising. Mediaedge:cia (MEC) is a founding partner in GroupM, WPP's media investment management group and is the first truly global Communications Planning and Implementation (CP&I) agency. Each year MEC recognises and celebrates it's best work through its Global 'i'deas competition. This brochure highlights the winning entries to create a persuasive sales document aimed at global brand directors who demand a return on investment. Identity for the North Bridge Brasserie, part of The Scotsman Hotel in Edinburgh, one of the Small Leading Hotels of the World. With its own entrance directly onto North Bridge, the hotel's bar and brasserie has undergone a complete refurbishment programme, and the brand identity has been designed to reflect the new modern and stylish interior, as well as to depict the famous bridge on which it stands. Simple design solutions are often the best. The 25th reunion of the Yale James Bond Film Society gifted us the perfect design solution. Brand naming and identity for a range of nationally recognised retail qualifications. RetailPlus is a real opportunity for retailers to improve the skill set of their team in order to develop a more efficient, customer-facing business, which in turn increases loyalty and profitability. As well as establishing the overall brand identity, we have also designed and produced a series of fourteen workbooks to date, along with supporting promotional literature.